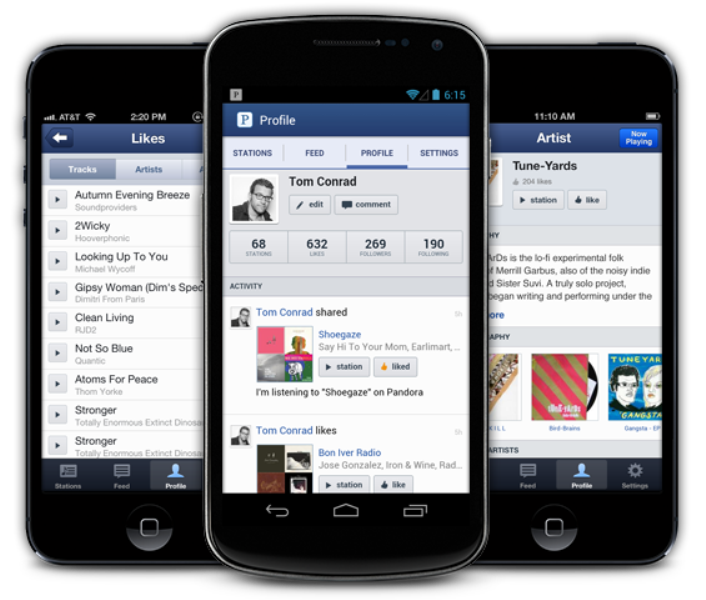 Pandora has released a significant overhaul today, mainly focused on its mobile reach and social features. As a veteran of music streaming, Pandora has managed to survive the onslaught of Spotify – not to mention worthy challengers like Last.fm and Rdio – while growing its user base and remaining a comparatively popular choice among artists. New station creation is very simple, and the function works while using the app. Simply hit the back arrow icon in the upper left-hand corner. From there, you can use the search bar or the plus sign icon as your create-a-station stops, and selecting a specific, already-made station allows you to add variety or change details (which is located under options). The only hiccup here is that hitting the station auto-plays it and launches you into the player. In order to add variety or edit details, you have to start listening to the station, hit the back button, and then you’re able to access these two features. Pandora has also added a progress bar so you know how far into each song you are. Using email and Facebook worked nicely, however. There’s only an option for including your own comments when you use email, for the record. You can also hit up the upward facing arrow on the bottom banner. The share option here redirects you to that same page where you can connect with Facebook or Twitter. You need to choose whether you want to share the track or the entire station. If you view your profile (which I’m about to get to), you can hit up Likes (which is everything you’ve thumbed up). Here, you choose an individual track, the share icon, and once again you’re back in the same hub where you can email songs or post them to Facebook or Twitter. 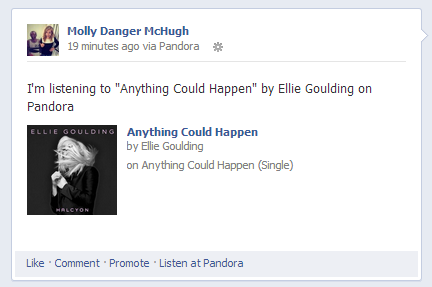 Suffice it to say, if you want to share what you’re listening to on Pandora, you’re more than able to. The new profile makes Pandora look a lot like your standard social network – you have a profile picture, a hub for your likes, followers, friends, and bookmarks, and an activity feed that people can leave comments on. You can find people to follow via the Feed icon at the bottom of the screen. Pandora wants to be more than just a music service, it wants to be a music social network, something that a variety of platform’s out there are attempting. Spotify is arguably the closest thing to it, but all the possible contenders are still hubs from which we share content out to our social networks. Pandora’s attempt is still a bit messy too: I don’t love the idea of a straight-up feed of nothing but songs I’ve liked, albums I’ve created, and those that I’ve shared. I also can’t really imagine myself commenting on other profiles a whole lot, although I’m sure that will get some love from devoted Pandora users. 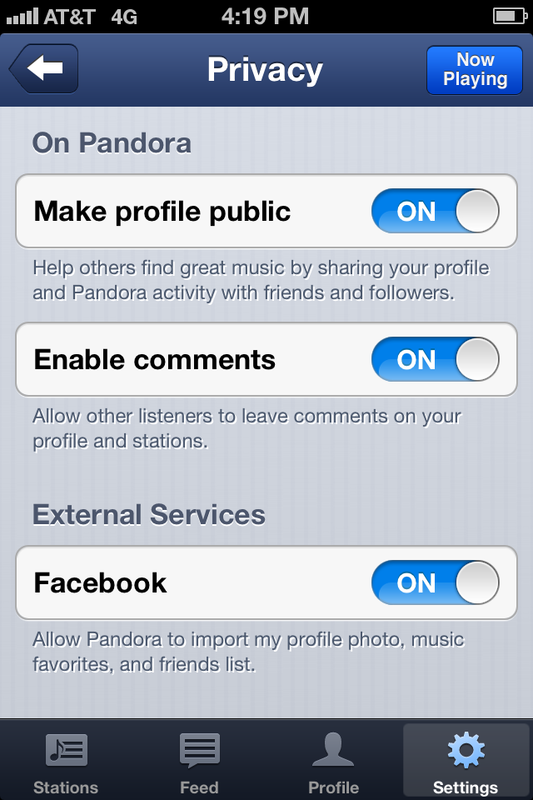 If you don’t want to display this timeline of Pandora activity, head to settings, privacy, and make sure public profile is turned off. Social sharing features are available on mobile for the first time with this release and allow listeners to easily share links to favorite stations and tracks with their friends and followers on Pandora, Facebook and Twitter. This is something our users have been requesting for a while, but unlike other apps with social integration, we don’t share your information with friends by default. If you don’t want to share, we’re not pushing it out to your network. 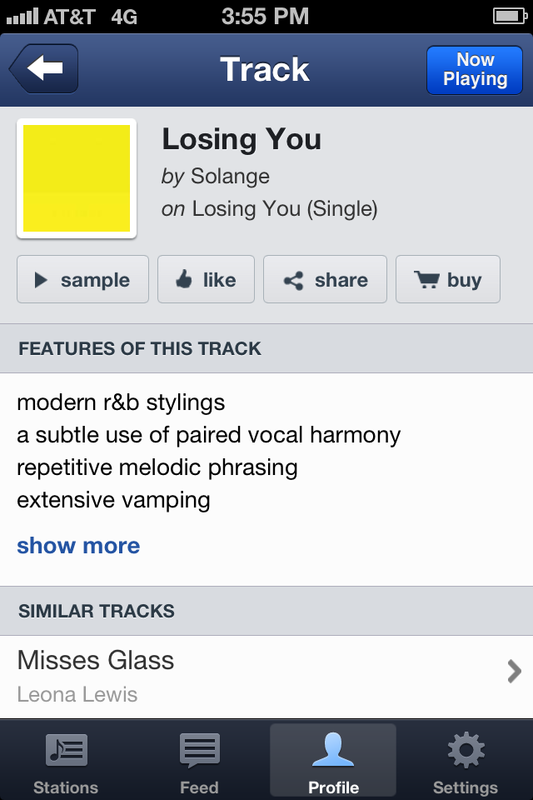 Pandora is arguably one of the best services for artist information. The new iteration of the app includes full screen artwork that you can toggle in order to find out more about the track and its artist, with incredibly detailed bios as well as lyrics, key song features, and a list of other similar tracks. Some of the more interesting data comes from the Music Genome Project. We all might know what a song’s genre is, but information about song structure and key tonality is something you’re really only going to find with Pandora – that’s not exactly in Spotify’s wheelhouse. 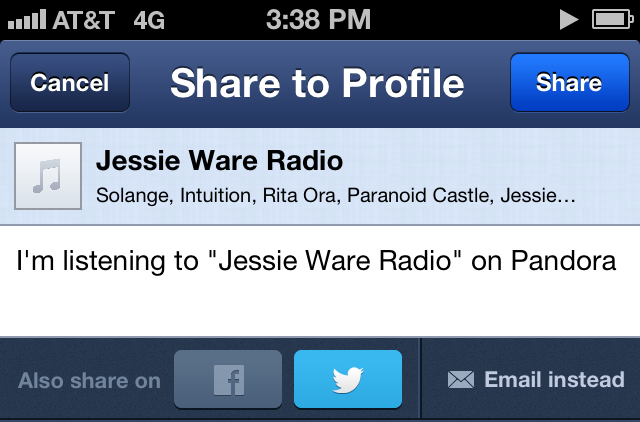 Kudos to Pandora for improving its mobile presence without too much reinvention; if it ain’t broke, don’t fix it. Pandora certainly isn’t broke, but with increasing pressure from new services (cough-Spotify-cough) and the impending launch of others (right, Apple? That’s happening… right? ), there’s definitely something to be said for a refresh. Pandora nearly hits all the right marks here by getting more fun and easy-to-use via smartphones (which is where most of its listening hours are coming from) and making what’s an admirable if lacking effort at its social element. 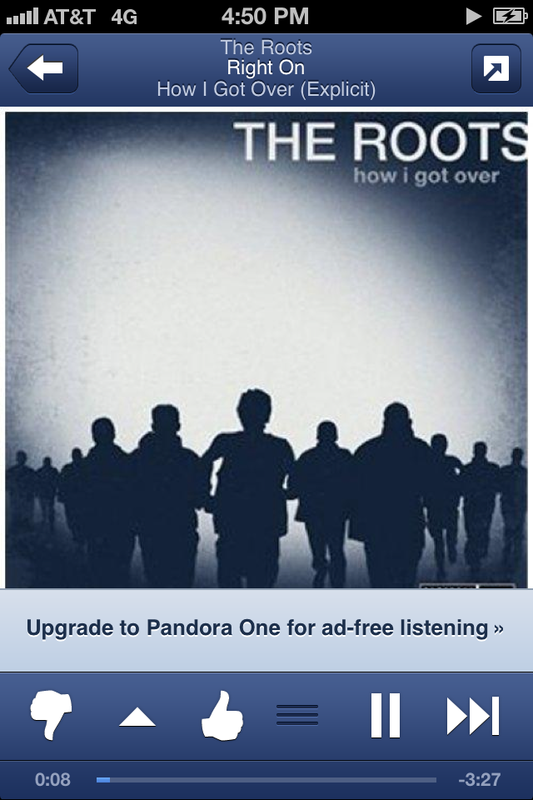 Pandora 4.0 is available for iPhone now and will be in the Google Play store within the coming weeks.